The exact origin of the idea that it takes a village to raise a child may be unknown, but Switched At Birth is quietly making the case that for the Kennish/Vasquez family it might just be the only way they can survive. It’s a notion the show has been slowly circling to ever since the pilot, when Regina and Daphne moved onto the Kennish property so everyone could get to know each other better. Then, bit by bit, this subtext builds until it explodes into actual text in “Ecco Mono,” a “What if?” episode that explores what could have happened if Regina would have revealed the switch to the Kennishes 13 years ago when she first found out. Alternate universe episodes can be a lot of fun or a complete disaster, depending on the intent and execution. Switched At Birth makes the smart choice of playing the drama occurring solely in John’s unconscious brain completely straight, as an honest-to-goodness look at what could have actually happened if John got exactly what he wished for in the previous episode: that the Kennishes raised both Daphne and Bay without any involvement from Regina. By treating the concept with seriousness and respect, an episode that could have been a simple flight of fancy or momentary diversion becomes something more: A genuinely moving, character-illuminating hour that proves just how important these two very different families have become to each other. Despite the straightforward nature, the episode still has plenty of fun along the way playing with the characters’ developed personas and tweaking them to fit these new circumstances. In John’s coma-dream, Regina told the hospital of the switch the second she discovered the issue, which snowballed into the Kennishes taking custody of both girls when Regina’s alcoholism is revealed in court. This one decision changed everything in the girls’ lives, mostly for the worse—especially because Regina’s inability to quit her alcohol habit (or John’s refusal to see the changes she made; it’s never quite clear) means both Bay and Daphne grew up with no contact with her whatsoever. Combine that with Daphne’s cochlear implant and Bay’s feeling that she never really “belonged” in her own family, and it’s basically a recipe for disaster. What’s great about how all of this plays out within the episode is that the writers never really spoon-feed the audience these developments—other than an awkward line about Daphne not being a vegetarian in this universe, most all character differences come through in the writing and performance rather than overt nods to the changes. The biggest difference by far is Daphne, who through her cochlear implant at a young age and inability to sign, completely loses her deaf identity. Without it—and under the coddling Kennish influence—Daphne is a sort of shallow empty shell, desperate to feel like she belongs anywhere and making the poor decisions that come along with that desperation. The missing pieces of her—pieces of Regina, of Adriana, of the recognition of her hearing loss—are things she doesn’t even know she’s missing, holes she tries to fill any way she knows how. As for Bay, her loss without Regina is far more acute and manifested more overtly than Daphne's, mostly as extreme awkwardness within her own family and an intense desire to flee so she can stop feeling like an outcast in her own life. That is, until she meets mysterious “hot deaf guy” Emmett and he helps her realize she should look for her birth mother herself so she can get the answers she craves. Emmett and Bay’s tentative relationship in this episode is extremely sweet and also the only thing that felt a bit shoehorned in to me as fan service in what was otherwise a really well-conceived universe. Still, even if Emmett’s presence isn’t necessarily organic it’s always pleasing to see Emmett and Bay in scenes together, especially when those have been in short supply lately. When Bay finds evidence of Regina’s desire to be in both her and Daphne’s lives, evidence John and Kathryn hid from them, watching both of them find Adriana and learn that Regina had died before they reached out to her was heartbreaking in a way I honestly didn’t expect going into this episode. This emotion works because we know Regina—the Regina who would raise Daphne, the Regina who fights for her family—and to see a world where this Regina doesn’t get the opportunity to do those things is absolutely devastating, both for her and for the girls. Most of all, though, it’s devastating to John. John spent his coma dreamscape watching every choice he made—choices he believed he was making for the right reasons, mind you—force his lovingly crafted family to crumble around him, and even cause him to potentially succumb to his collapse instead of being saved by Regina. It would be easy to dismiss the relief John feels at realizing his dream wasn’t real and his messy, imperfect family of both Kennish and Vasquez origin is still intact as a cheat in his character development, allowing him some sort of divine enlightenment as a shortcut to actually putting in the work. But by keeping the emotional through line of this episode so firmly consistent with what came before in the “real” timeline, it totally works as a legitimate character arc. Yesterday, creator Lizzy Weiss tweeted that this episode was a treat for longtime fans, and in watching it’s easy to see just how much care and consideration the episode has for both the show’s fans and the characters the writers are serving here. When John wakes up from his dream and greets Regina by saying “Thank God you’re here,” it’s easy to also see that as a meta declaration as well, from the show to the fans. But fans of great television are just as thankful shows as thoughtful and quietly wonderful as this exist. 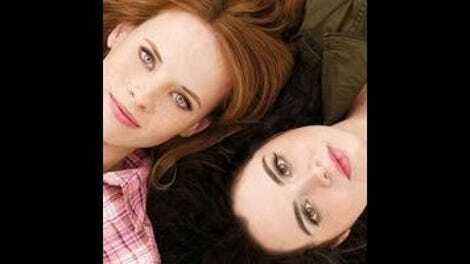 Thank God you’re here, indeed, Switched At Birth. Carrie Wikis Some Art: “Ecce Mono,” 2012, Cecilia Giménez, fresco restoration gone to hell. This is my favorite episode title to date, by a large margin. What a fun little joke. Baby Toby, Bay, and Daphne are downright adorable, and baby Daphne asking about her mommy was absolutely heartbreaking. Bay’s outcast wig? Not so adorable.